My, oh my, cherry pie | Make, do and grow! Food and foraging. Making things and upcycling things. Mostly experimental, always fun. I wanted to make a cordial, but didn’t really have enough so the obvious second choice was pie! 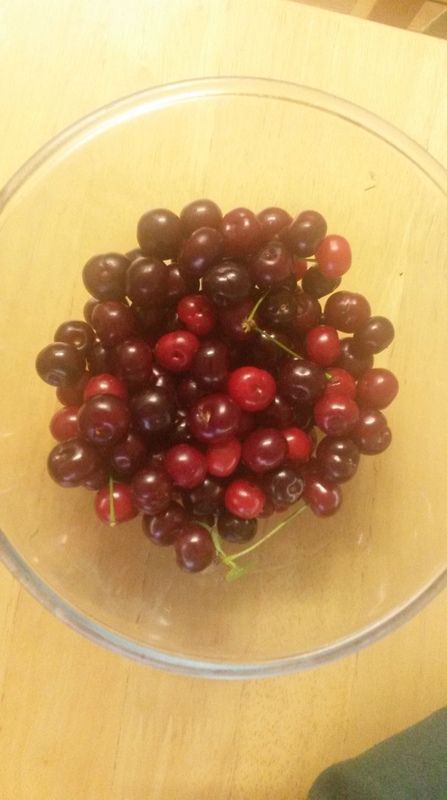 I found a recipe online – mixing my sour cherries with regular store-bought cherries gave me enough fruit to get more than a smatter of filling. Adding a couple of table spoons of sugar and some cornflour made them reduce to a jammy sauce when they cooked down. Finally instead of doing a normal or lattice pie lid, the recipe suggested a crumble top with oats and almonds – I thought that sounded yum so thought I’d give it a try. Not bad for the first pie I’ve made in a while – the cherries were lovely, although I wish I’d had enough to do only sour cherries inside – I think the sweet ones detracted from the overall depth of flavour a bit. Also I blind baked the pie crust for a bit too long so by the time the whole pie came out at the end it was a little bit too brown – not burnt but definitely more brown than golden! 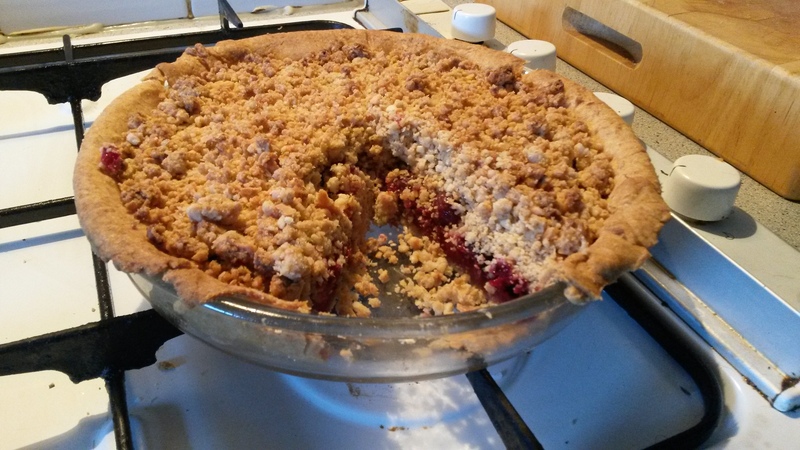 Crumble was also a great choice for the topping – the sweetness wasn’t overpowering and the almonds were obviously a great match for the cherry filling – I think I actually prefer crumble top to a pastry one. You can get pastry overkill! But due to limited amount of filling I think crumble to filling ratio wasn’t quite spot-on…all learnings for next time. And in future – I need to make more pies! I really enjoyed my slow afternoon baking with the radio on. Just got to find another free source of fruit…I remember finding Damsons and wild plums on a weekend out of the city the year before last so I think, come September, it might be time for another ramble/forage.